Becoming a card shark may be pushing it this week but at the very least I want to learn more about playing cards. The week I learned about chess I thought how fascinating it is that there are certain games that have existed for centuries that people still play today despite the advent of technology. In many cases technology continues to spur them on. Card games were some of the first apps to show up on the iPhone. Playing cards were first invented in China as early as the 9th century and came about simultaneously as the development of using sheets of paper vs a long role of parchment as a writing medium. 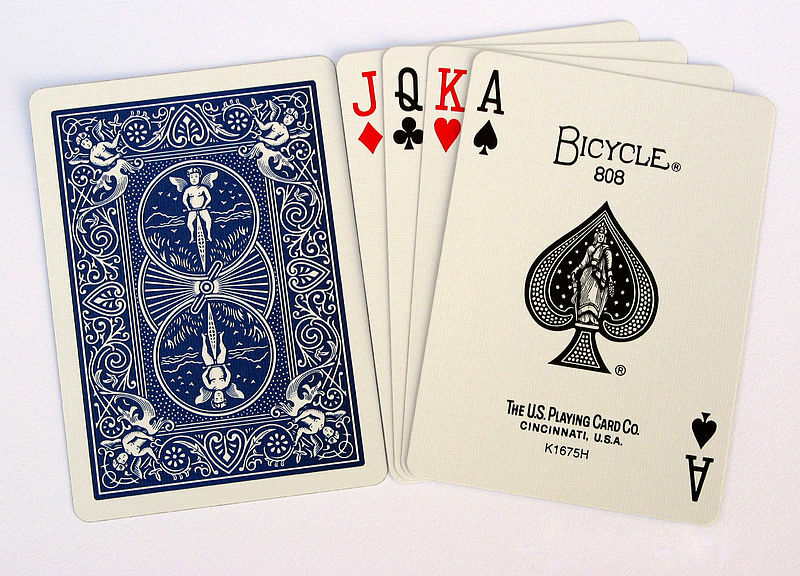 Originally cards had a variety of suits but the 4 used today originated in France (c. 1480) – hearts, diamonds, spades, clubs. It is also believed the ability of the Ace to surpass the value of the royal cards originated during the French Revolution. At that time the royal cards were also replaced with cards that reflected the ideals of the Revolution – Liberty, Equality, Fraternity. Those were short-lived with the rise of Napoleon. While cards were probably invented as a diversion, by the 17th century, there was a name that became applied to those people who used cards to swindle less experienced players, “card sharp”, more commonly known as “card shark”. Playing cards, like playing chess, is not only a game but a reflection of life. When I did ancestry week my dad told me how he learned poker from his father and how it taught you a lot about other people and their character. They had a poker night where one of the guys who worked for his father had cheated and got caught by the group. The next day my grandfather fired him because he felt if that guy was willing to cheat in a game of cards he didn’t want that kind of person working for him. Cards reveal. They show whether someone is cool under pressure, whether they’re a graceful winner or a sore loser. Beyond the realm of play, it’s fascinating how many people look to Tarot at what’s “in the cards” to tell them about how their future will unfold. 1) Card games – I know a few games here and there but I want to get to a point where if I’m looking to pass the time I can pick up a deck and have a few games to choose from. 2) Poker – I have never played poker and I’d like to get a group of friends together for a poker night. I’ll have to save that for the end of the week so I can work on my hustle a bit. 3) Card trick – I think everyone, at the very least, should know one good joke and one good card trick to share. While I don’t have either currently in my repertoire I’m going to work on the card trick this week. 4) Tarot – I think it would be fun to see what’s “in the cards” for my future this week. There are multiple readers on Pearl St. here in Boulder (surprise) and it would also be fun to try a reading on my own. 5) Tables – I’d like to hit the Blackjack tables at Black Hawk. Blackjack is the one card game I know how to play fairly well, but I’ve never tried the tables here in Colorado. I’ll have to agree with my husband on what my limit is before I go. You are currently reading 52 cards at 52 To Do.